The West Point Band, above, will perform alongside the New Milford High School wind ensemble April 22 in a concert at NMHS. One of the premier bands in the country will take center stage at New Milford High School on April 22. The West Point Band will perform in concert alongside the high school’s wind ensemble. The free event will start at 7 p.m. at the Route 7 South school. The 35-member New Milford wind ensemble will kick off the concert with several pieces. They will be followed by the West Point Concert Band. The two musical groups will then collaborate for two pieces: the West Point Band March, which will be conducted by Syzdek, and “Stars and Stripes Forever” by John Philip Sousa. “I’m tickled,” Al Bayers, former longtime NMHS band director who helped coordinate the visit, said of the band’s visit to New Milford. Bayers was a member of the West Point Band from 1959-62 and has maintained friendships with many of the former and present members. “The musicians are individually all outstanding,” he said. The West Point Band, which marked its 200th year in 2017, is comprised of professional musicians who hold degrees from some of the world’s finest music schools. The band is the oldest continuously serving Army band, and the oldest unit at West Point. It consists of 88 members. 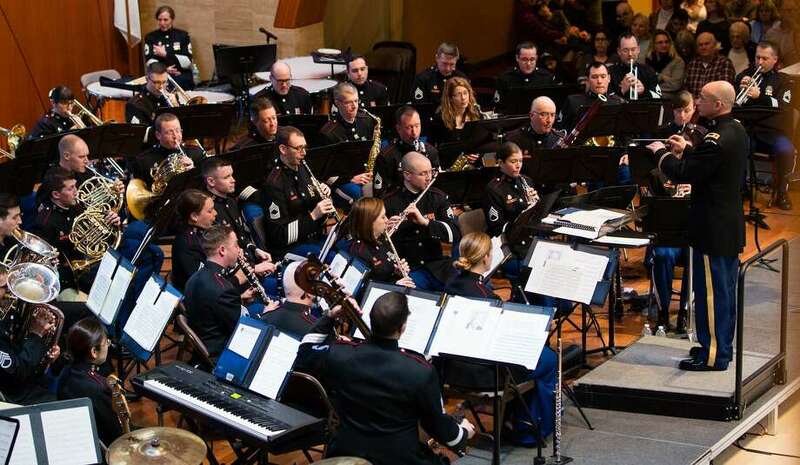 It is split into three performing components: the concert band, the Hellcats — its field music group — and the Benny Havens Band, a popular music component of the West Point Band, according to Staff Sgt. Erin Beaver. “As ambassadors of the United States Military Academy, outreach is one the biggest parts of our job,” Beaver said. “The West Point Band believes strongly in supporting tri-state area schools and their children through music education, and we’re delighted whenever there’s an opportunity for this kind of side-by-side collaboration. “As military musicians, it’s our goal to reach people through music, and to share the inspiring stories of the Academy and Army — but in the end we always end being inspired by the enthusiasm and dedication of the students we work with,” she said. Syzdek said he looks forward to the concert and hopes it draws a good crowd. “Just to sit on stage and in the audience — to hear a band of this caliber perform is something,” he said. Free ticket reservations can be made by emailing newmilfordbands.tix@gmail.com.